•	4 cups of water. •	1/2 a cup of rice. •	1 1/2 a cup of sugar. 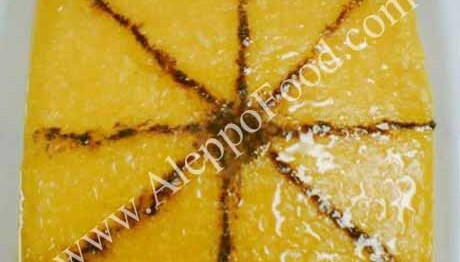 •	1/4 a teaspoon of saffron, soaked in 1/2 a small cup of water. •	A sprinkle of musk. •	Put water and half of the sugar amount and rice in a pot and then put it on heat with continuous flipping until the mix boils, then reduce the heat below the pot until the rice becomes well cooked. •	Put the rest of sugar and saffron and musk on rice, then flip continuously, then leave it on a backburner to boil with continuous flipping until the mix becomes thick a little or for 30 minutes approximately. •	Raise the pot from heat and pour the contents in small plates and then put them in the fridge, then serve them cold.